Lyon's Daniel Manon introduced the Arola to the world in January 1976. 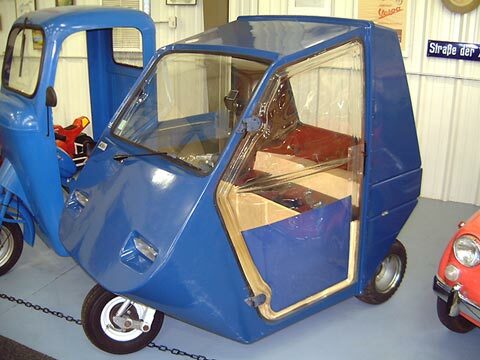 This little enclosed moped with its distinctive shape set the pattern for a host of such vehicles in the next few years. It was destined to become one of the most successful of the French "voiturettes". This example is the early 3-wheeled type 11, with power by Sachs "cyclomoteur" and two-speed automatic "Saxonette" drive. The 3 hp motor gave the 242 lb car a top speed of around 40 kph. A pick-up version, the "Super Pratique", with a small box over the rear wheels, was also available.A four-wheeled version, the Type 14 soon followed, with Motobecane 50cc engine.The car grew longer and heavier, and a BCB 125 cc motor became available on the Type 18. The Minoto was taken over from Bel-Motors, makers of the Veloto, in 1982, by which time the company had relocated to Aix-les-Bains. However, this was unable to keep the company from bankruptcy in 1983. It emerged from the ashes as the well-known firm of Aixxam. Weight: 110 kg Electrics: 12 v 3 Wheels: 4.00 x 8"